The OET Reading Part A test is unlike anything that you’ll see on IELTS or PTE. It’s been designed to mimic the kind of fast-paced reading that you need to do in a medical situation. It’s hard! This blog will tell you exactly what it is and how you can pass it using E2Language.com’s “secret step-by-step method”. What is the OET Reading Part A? OET Reading Part A is a ‘summary completion’ task. What does that mean? It means that you are given a summary of four short texts with GAPS. Your job is to fill the gap with the correct word taken from the TEXTS. Sounds simple? Well… keep reading because you need a Step-by-Step method to complete this one. Just below the INSTRUCTIONS and just above the TEXTS is the TOPIC. Can you see it here in red? 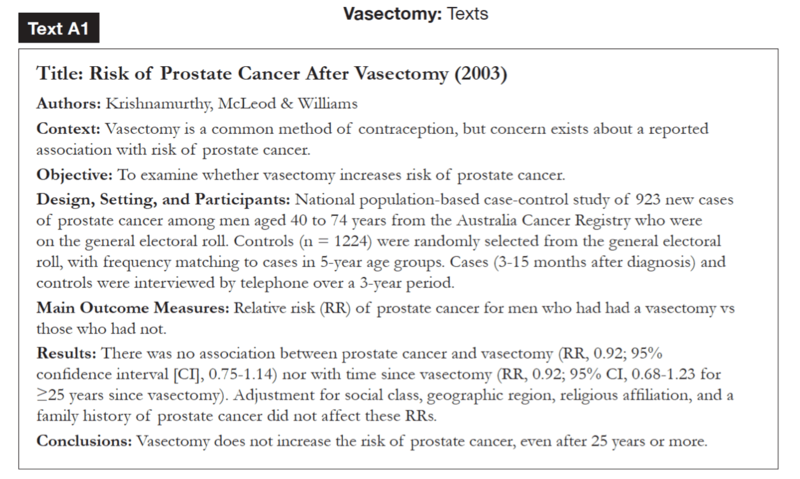 That’s it: The topic of these TEXTS and the SUMMARY is Vasectomy. How long did that take you to identify? It should take you less than 3 seconds to find and understand. Identifying the topic is the best possible start. It will prime your brain with relevant language on what the TEXTS and SUMMARY will be about. You don’t want to waste valuable seconds looking at the TEXTS trying to deduce what they are all about because the TOPIC gives it to you immediately. You need to be able to quickly identify the TEXT types. Glancing at the TEXTS and being able to identify them will help you enormously because the SUMMARY will directly relate back to these TEXTS. If you see a reference to statistics in the SUMMARY you know that the answer will be in the statistics TEXT, for example. I know it’s scary because the clock is ticking down but you need to spend 1-2 minutes speed-reading the TEXTS. You need to get an idea of what they are about. If you miss this step you will not be able to fill out the SUMMARY correctly. 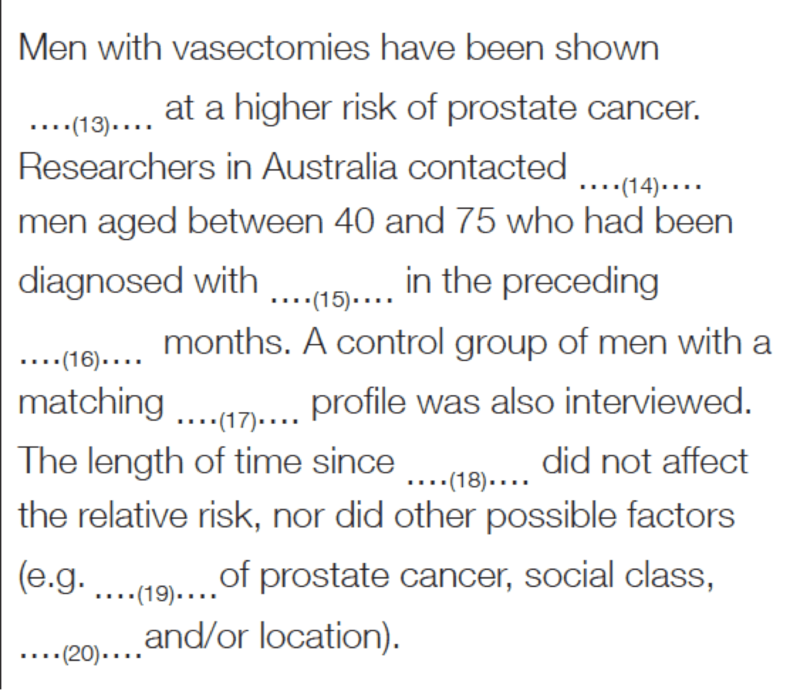 The title states the “risk of prostate cancer” after vasectomy. That’s the general idea. Now it’s time to look at the SUMMARY. What you’ll notice in the SUMMARY is that there are clues as to which TEXT you should look at to find the word to fill the gap. There are clues in here as to which TEXT you should look at to find the correct words to fill the gaps. Can you remember which one it might be? 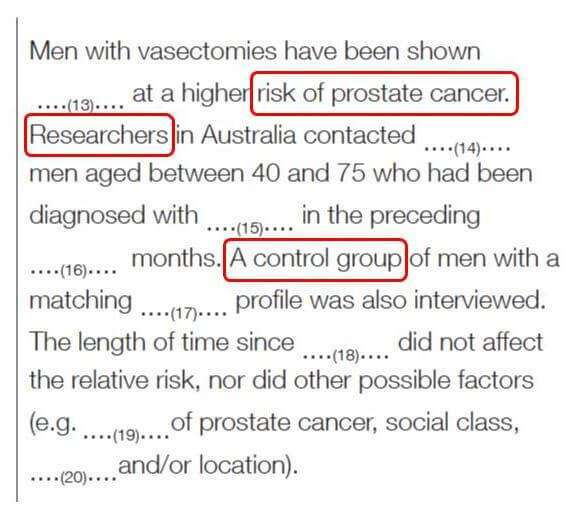 These KEYWORDS directly link back to the TEXT that was about research. Remember? Aha! This is where we need to go to fill the gap correctly. Keep in mind that each paragraph in the SUMMARY usually contains information from one paragraph. Sometimes, however, each paragraph in the SUMMARY may contain information from two TEXTS. 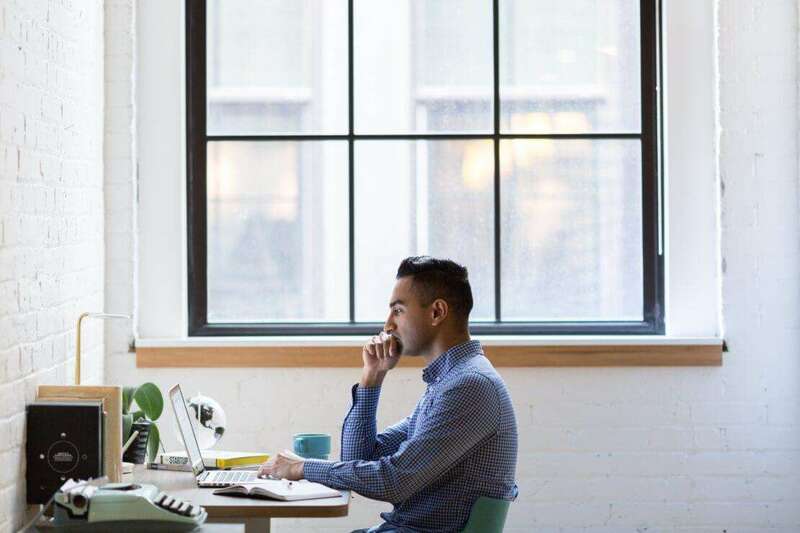 As a result, you may have to look at the TEXT on research and the TEXT on statistics to fill the gaps for that single paragraph. Most of the time you cannot take a word directly from the TEXT and fit it directly into the gap in the SUMMARY. The word may have to be changed to fit for grammar or meaning. Sign up to www.e2language.com/home/oet to see the rest of the STEPS to complete OET Reading Part A successfully. If your OET exam date is nearing, you may need to do an OET preparation course. E2Language.com has OET sample tests, including OET reading sample tests including lots of practice for OET Reading Part A. Our course is 100% online – OET online. If you need OET writing tips or an OET writing sample then sign up today! Please help me to score B in OET. My exam is on 4th december, Sunday. Wow, you don’t have much time! Have you signed up to our OET free trial? With so little time, the best we can do is offer you our free practice material in the free trial. If you end up having to re-take, please consider joining a course with us so we can work with you to improve and skill-build to get a B.
I only need to pass d reading. I got my result yesterday and I got c in all . Can you please help me to get b in all ? Please send across your latest test scores, the scores you are looking to achieve and your next test date to hello@blog.e2language.come2language.com so that the Duty Tutor can assist you. I need help to pass the reading test only. Both part A and B. Do head over to our website to check out the different plans and packages that we have. Alternatively, you can also email us at hello@blog.e2language.come2language.com so that the Duty Tutor can assist you. I’m interested on your Online Training. May I know much it cost?I need to sign up ASAP. The cost would vary based on the package that you opt for. We would be happy to help you in choosing your package. Please send across your latest test scores, the scores you are hoping to achieve and your next test date to hello@blog.e2language.come2language.com so that the Duty Tutor can assist you. so please help me how to get material? We would be happy to help you pass your test. Please send across your latest test scores, the scores that you are hoping to achieve and your next test date to hello@blog.e2language.come2language.com so that the Duty Tutor can assist you right away! Hi Jay, I got C in reading and writing. I really need help with that. i gave couple of time the exam and always stuck with reading. Thank you. No worries, we are happy to assist you here. Please reach out to our Duty Tutor here and raise your concerns. I am confident that they would be happy to assist you.